A week ago we were visiting Son’s parents, and his mother sent a couple of mangoes back with us. Now I have had mango pudding and mango ice cream before, but I don’t think I have ever had an actual raw mango! Yum! They were some really good mangoes, so we decided to make some sushi with it. 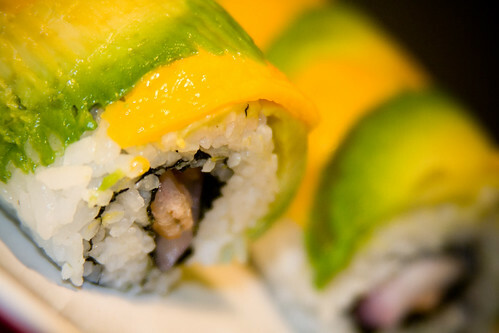 Recently I keep hearing about mango salsa, and it sounds really good… so I figure why not make a sushi version? Eating this was like having a party in your mouth! It starts out smooth and sweet because of the mangoes and avocado on the outside, then a contrasting salty crunchy taste of the shrimp and red onion kicks in. Plus the cilantro adds an interesting small and gives a kick to the sushi. Our regular readers might have noticed a bit of a change in the site. We now have nutrition facts for our sushi! These are by no means exact… they have been calculated based on the individual ingredients so some of the rolls (especially the fried ones) may not be exactly right since I haven’t been able to completely compensate for the cooking methods. Some of the recipes don’t have the nutrition facts calculated yet since I haven’t been able to find the nutrition facts for all the ingredients. One of these days I’m going to have to walk around the grocery store with a camera, taking pictures of all the ingredients that I have used in my sushi! Eventually they will all be up though, so if your favorite sushi doesn’t have the nutrition facts up yet, don’t worry! They will be up soon! Slice the avocados into very thin (but still thick enough so they don’t tear when you put them on your sushi) slices. Remove the skin from the mangos. Slice the mangos into very thin slices, similar to how you sliced the avocado. Cut the red onion into slices. 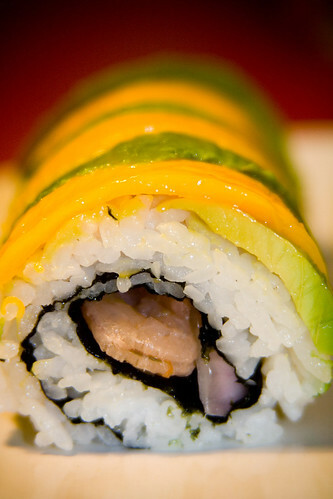 Using shrimp, red onion and cilantro as your fillings, roll the sushi inside-out. Place alternating thin strips of avocado and mango across the top of the roll, and squeeze them into the roll with the rolling mat so they stick. Serve with wasabi, shoyu, and ginger (if desired). Enjoy! Awesome move on the nutritional info! This sounds absolutely wonderful. I’d love to try it some day. 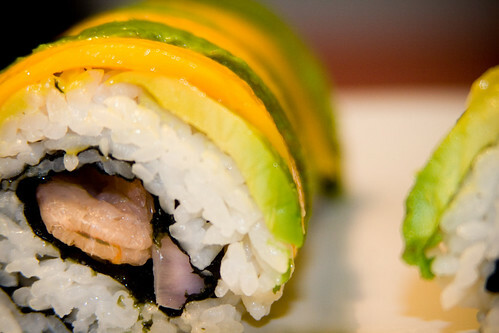 I love Mango and I love Avo and have recently discovered sushi, so this is perfect. Thanks for posting! Lovely Blog!! I’m right into sushi and enjoy making my own. You’ve given me some great inspiration – thank you. Sarah-Leigh – Awesome… I hope you like it! Lorna – Yep… I use that website a lot, but it doesn’t have all the ingredients I use, like some of the more Asian ingredients. Looks great. I will give it a try. Is there anything I can sub the shrimp for? You can substitute anything for the shrimp, depending on your preferences. If you want something vegetarian, you can choose tofu or a favorite vegetable, or you can substitute some sashimi for it (tuna would be great) if you like raw fish. you know you can compile all these recipes in an ebook and sell it. They are great. Excellent post, will have to try this one. This one really looks delicious.I would love to try this at home..thanks for sharing the recipe.More Power! Mhhm, it seems so tasty that I can’t wait till I try this out.